Ceramics are made of nonmetallic and inorganic materials and is defined as the art or technology of creating items from clay and other materials that are then fired. 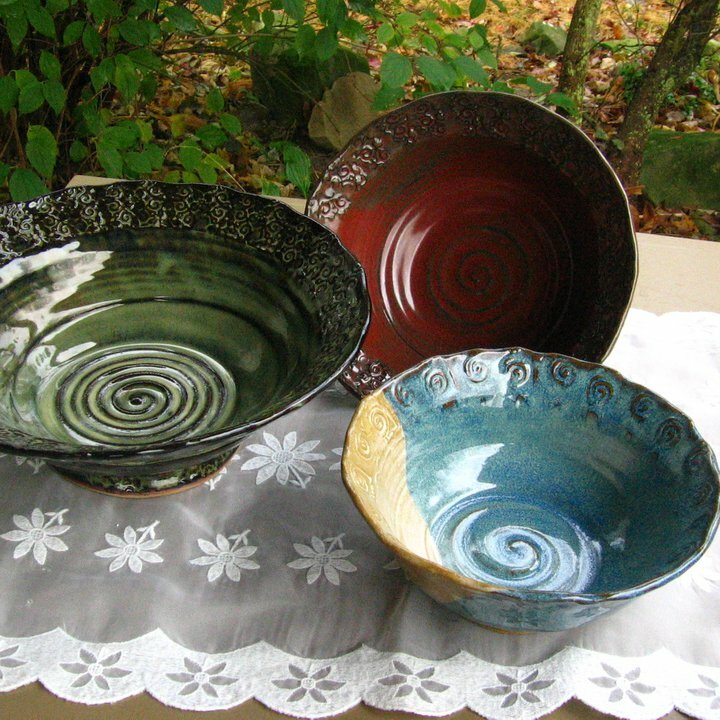 Ceramics examples include items such as handmade pottery created by using clay that is hardened by heat. Ceramics and pottery have been around for centuries, with items having been unearthed that date back to the year 24,000 BC. Not only are ceramics used to make useful everyday items such as plates, bowls, and cups, they can also be used to make decorative items such as figurines. Here we examine some of the ceramic methods and types of ceramics used and created by potters. There are several methods that the potter can use to create beautiful ceramics and pottery pieces. Some of these involve the use of a potter’s wheel, while others do not. When the potter incorporates the use of the wheel in the process, this is known as throwing. When the artist uses simply his/her hands and basic tools, this method is known as handbuilding. The pinch method is another way to make ceramics that requires only the use of the hands. The potter would shape a ball of clay and place their thumb into the middle, while at the same time rotating the ball of clay while gently holding and rotating it in the other hand. Beautiful pinch pots can be created using this simple method. Score and slip is a method used to attach two or more pieces of clay together. This process must be completed at the “leather dry” stage of the drying process, while the clay is still somewhat wet and is still workable. The pieces to be joined must first be scored by scratching up the two surfaces that are coming together. Then you “slip”the areas to be joined by using liquid clay that acts like a glue, referred to as slip in ceramics. The pieces to be joined are then pressed together to form one piece. Completing this process at the proper stage of drying is essential so that the pieces will not apart when fired. The coil method is done by creating ceramic pieces by rolling out ropes or coils of clay. The pieces can then be joined by using either tools or the hands. Another method, known as molding, involves using flat slabs of clay and pressing them into molds. This method can be used to create specific shapes and forms that cannot be done using the other methods. Slipcasting is another technique in which slip, the liquid clay, is poured into a mold made from plaster. The mold acts to draw out the water in the slip and eventually leaves behind the solid clay formation. When dry, the clay shape can then be removed from the mold. Earthenware is a term used to describe pottery types that are non-specific. This type of pottery is fired in the kiln at lower temperatures than other types of ceramics, and if the finished piece remains unglazed it will be slightly porous. The process of vitrification, or transforming into a glass, does not occur under these lower temperature settings. Much of the ancient pottery discovered in excavations is earthenware. Some characteristics of earthenware include the fact that is in non-translucent, heavy, thick, weaker than stoneware, chips easily, easy to work with, and is less expensive than other types of ceramics. In order for a piece of earthenware to become watertight, it must be glazed properly. Porcelain is a type of ceramics created by using a soft, white clay known as kaolin. The clay is then heated to temperatures of 2,192 to 2,552 degrees Fahrenheit which turns it into a type of glass. A mineral known as millite is also formed when the clay is heated to these high temperatures, which helps to give the porcelain its translucent quality, along with its strength. Porcelain is also commonly referred to as Fine China or China. Porcelain possesses elasticity, has low permeability, is strong, hard, white in color, resonant, translucent, and resists both thermal shock and chemical attacks. Some common items made of porcelain that you might encounter in daily life include bathroom sinks and toilets, as well as the China dinnerware sets you eat from each day. Stoneware is a type of ceramics made from non-refractory fire clay that can be either vitreous or semi-vitreous. This clay is typically only fired once at temperatures between 1180 and 1280 degrees Celsius. For a higher quality glazed finish, it may be fired twice. There are several categories within the stoneware category. These include: traditional stoneware, fine stoneware, chemical stoneware, thermal shock resistant stoneware, electrical stoneware, and flintless stoneware. Traditional stoneware is commonly used for large pieces, is dense and opaque, and is made from fine-grained secondary , plastic type clays. Fine stoneware is used to produce tableware and art pieces. Chemical stoneware in used in the chemical industry and is resilient to substances such as acids. Thermal shockware stoneware has added ingredients to enhance the resistance to thermal shock, and electrical stoneware was commonly used in the past to produce electric insulators. Flintless stoneware contains no silica, flint, or quartz, but only natural clay. Ceramics and pottery have been a part of people’s everyday lives for centuries. Ceramics can be used in everything from the simplest of bowls to the most expensive and elaborate vases. Think of all the daily uses for ceramics in our modern culture. From the morning mug of coffee, to the toilet in the bathroom, to the dinner plate at supper time, to the vase you use to hold fresh flowers, ceramics are a useful and functional part of our modern lives. Aside from the practical, some of the most beautiful pieces of art have been created using ceramics and pottery techniques. Ceramics can also be a very fun and creative hobby, and can even become a career for some talented artists. Many local community colleges offer ceramics classes to help you get started exploring ceramics as a hobby. Also, many ceramics stores have opened that allow people to create their pieces and provide use of the kiln for firing your projects.